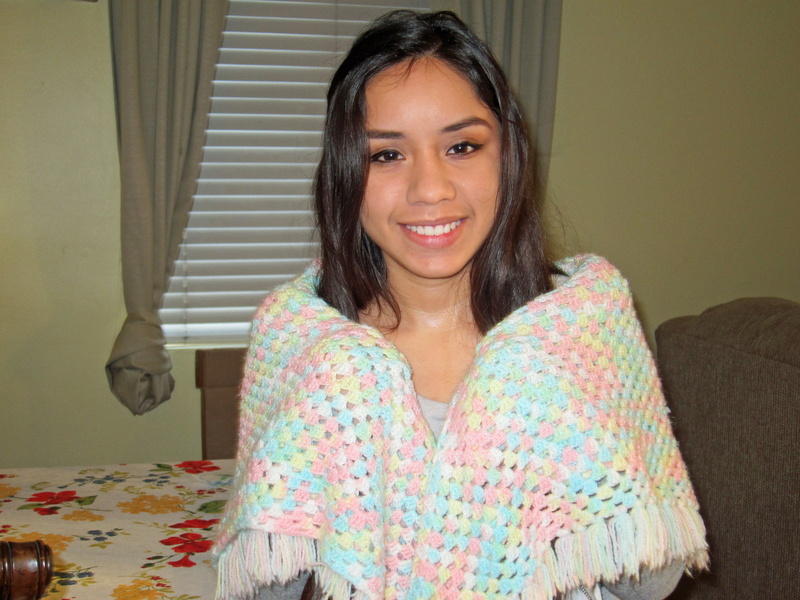 I learned how to crochet when I was in junior high. I think I was maybe 13 or 14 years old when my friend Debbie taught me. She lived with her mom in a small apartment and it was just the two of them. I enjoyed spending time with her when we weren’t in school. She was an only child and I had an older brother and no one around my age at home who I could talk to so we got along great. We’d share secrets and talk about the cute boys at school or about how unfair our mothers were by not letting us wear makeup. Those were the simple days where there was no internet or cell phones to carry around. Us kids actually talked on the phone, the house phone mind you. Now I can just imagine the horror if my kids were asked to give up their cell phones and just use the house phone to call up their friends. That would just seem so foreign to them and would definitely cause all %#&* to break loose…lol! Anyway, back to my friend Debbie. 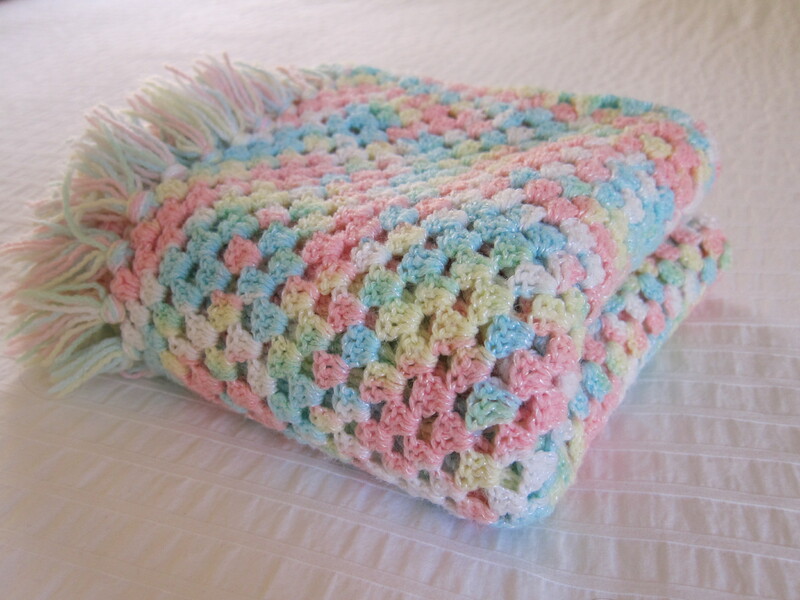 When I would come over I would notice a pretty crocheted blanket sitting out that she had been working on. So I asked her to teach me and she did. She taught me how to make granny squares which brought absolute joy to this bored teenage girl. I have to smile at this sweet memory because we were two teenagers who had no interest in shopping or hanging out at the mall. Our most fun moments were spent in her little apartment with her teaching me how to crochet as we laughed and giggled at the silliest things. I don’t know what happened but after junior high we drifted apart and we lost touch all together. She was a sweet friend and I think of her often and hope to someday find her through Facebook or through some other source. If anyone knows of a Debbie or a Deborah Ware who attended Hughes Junior High School in Long Beach, CA about 31-32 years ago please direct her to this blog and let her know that Ingrid Urey Bolanos is thinking of her old friend and would love to hear from her. 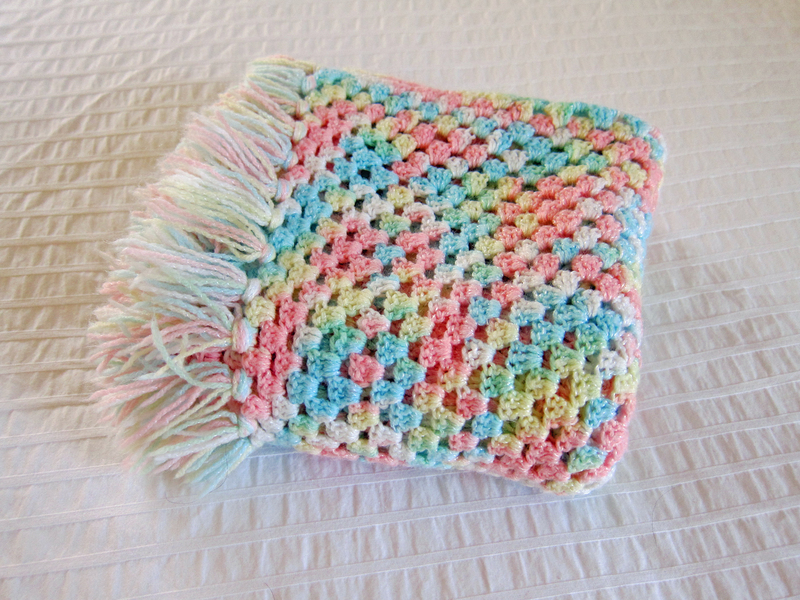 About a few years after I lost touch with Debbie I started crocheting my very first blanket. Went to the yarn store and bought a couple of skeins of multi colored yarn. So I started crocheting with no real purpose or idea of who I was making the blanket for. 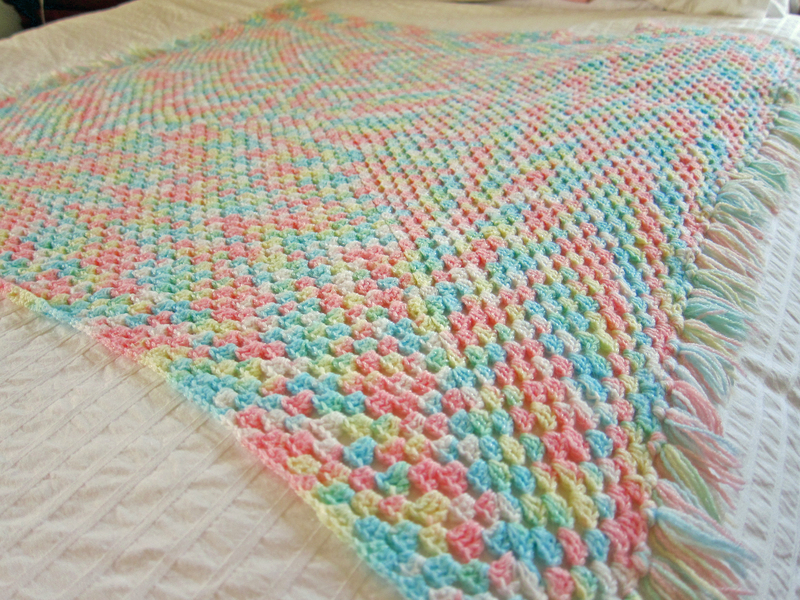 But once it was done I realized that it was more of a baby blanket because the yarn was a multi pastel colored yarn. 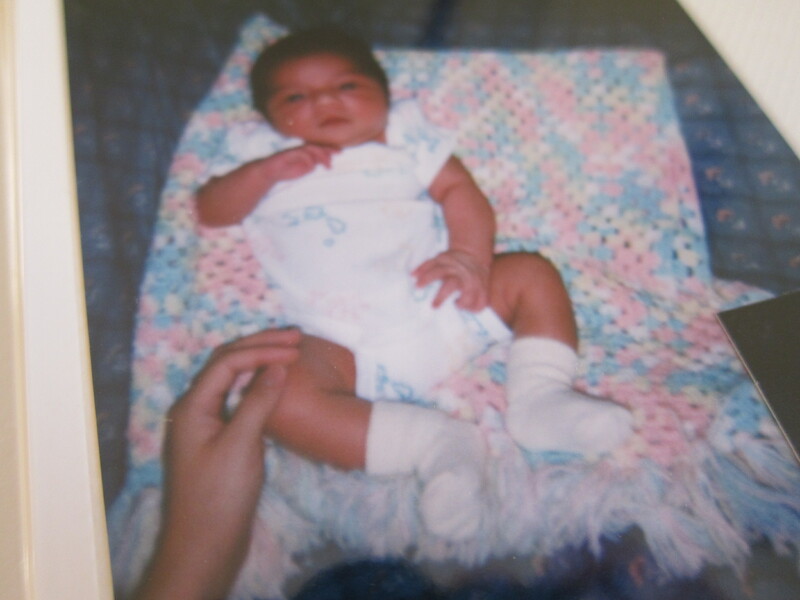 I must have been 16 or 17 at the time and saw no point in giving the blanket to anyone unless they were having a baby and I didn’t know of anyone who was expecting at the time. So I kept the blanket, folded it and put it in a box for safe keeping with the random thought that “maybe I’ll have a kid some day”. Many years later I moved out of my parents house and into my own apartment and as I unpacked I came across the blanket and ran my fingers through it and just smiled. I was older and this time I took the time to look at the detail of the blanket and was surprised at how nicely it turned out. After admiring it for a few moments, back in the box it went. The next time I took it out was in 1997, the year my oldest daughter was born. I just melted at the sight of my beautiful daughter wrapped in the very blanket that I carefully and meticulously crocheted as a young girl not knowing that I was actually saving it for her. Today that same blanket is referred to as “my special blanket” by my 16 year old baby girl. What a beautiful story and blanket! I have one exactly like this one from my childhood. What sweet memories for you and your girl!